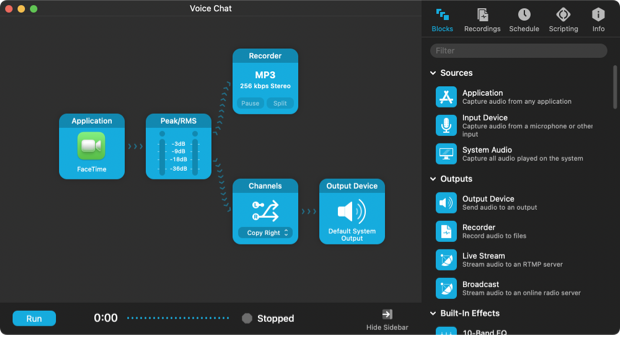 One of Audio Hijack’s most popular uses is to capture audio from voice chat (or VoIP) applications, particularly Skype. We’ve made this easy to do with the Voice Chat Session template. To get started, choose "New Session" in Audio Hijack to access the Template Chooser, then select the "Voice Chat" template. This template provides a setup specifically designed for recording voice chats. Both halves of a conversation are recorded, but you'll only hear the remote party in your headphones. You'll notice that this template sends audio to two outputs in parallel: a Recorder Block and an Output Device Block. The audio sent to the output device is adjusted with the Channels effect, which duplicates the remote audio (on the right channel) into both ears, so your own audio is not played back to you. This won't affect your recording, only the audio you hear as you chat. To prevent echo and feedback loops in the audio, all parties should wear headphones when using voice chat applications. You've likely seen radio DJs with closed-ear headphones on, which they wear to prevent the audio they're hearing from leaking in to their microphone. The same idea applies to your voice chats. You want to isolate the other party out of your microphone. 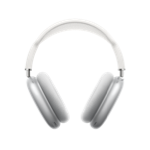 In an attempt to make it possible to chat without headphones, some voice chat applications like Skype do rudimentary noise cancelling. However, this tends to be unreliable, in particular when recording with Audio Hijack. Be sure to use headphones when recording voice chat with Audio Hijack. 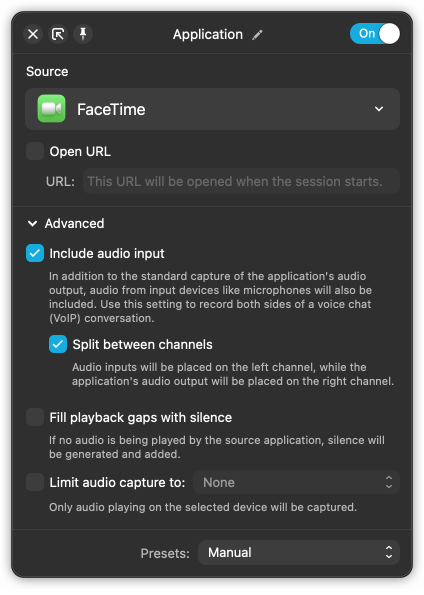 1) Pulls in audio from both the remote party and from the microphone you're using with Skype. This is controlled by the "Include audio input" setting in the Advanced options for the Application Block. 2) Splits audio into two channels, placing the local audio (you) on the left, and the remote audio (the other party or parties) on the right. This is controlled by the "Split between channels" setting, also in the Advanced options for the Application Block. This setup reflects what's most commonly desired, but you can always adjust it by changing the Advanced settings, pictured above. For a full list of automatically supported voice chat applications, see this page. Skype version 8 made significant changes to the way volume levels are handled, and now adjusts its volume in a non-standard fashion. As a result, audio captured from Skype may playback via Audio Hijack at a reduced level. To fix this, a Volume block can be placed just before the Output Device node in Audio Hijack, then adjusted to restore the original playback volume. Only local playback while chatting may be affected. Audio Hijack automatically ensures that audio is recorded from Skype at the correct level.